A History of the United Church of Canada. In recent years the United Church of Canada has embarked on a series of "diagnostic" type conversations assessing who we are as a denomination and where we are going in the future. Personally, I don't think it's that bold of a prediction to say that the United Church of Canada's future is pretty bleak and that it will be dead in the next 5-10 years. To use a biblical expression, the writing is on the wall. For anyone who wants to know why the United Church is dying they need to look no further than a recently published survey dealing with the history of the United Church. It's appropriately entitled A History of the United Church of Canada and it's a gathering of chapters offered by scholars and clergy with a deep and profound connection and commitment to the denomination. 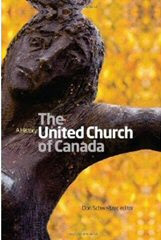 Edited by Donald Schweitzer this collection is an effort to survey the chronological story of the United Church. This collection also introduces and discusses key issues, decisions and challenges that the United Church has faced throughout its history. Perhaps most important of all, it helps name those seeds that have helped contribute to the pending death of the denomination. These seeds may surprise readers. The first seed I'm referring to is one of the principal motivations behind the creation of the United Church. It's also something that remained a large part of United Church thinking throughout its early decades. I'm talking about a sense of entitlement displayed by groups and individuals throughout the United Church's history. When it was envisioned and created one of the main hopes for and expectations of the United Church was that it would become a "state church" that would reflect Canadian values and hopes and dreams. There seemed to be a hope that the vision of the United Church would be somehow consistent with the vision of Canada as a nation. It was also hoped that the United Church would be a real player on the world stage, especially where church unity was becoming such an important concept. These hopes and expectations were realistic in their time but they ultimately "stalled out" as the denomination ran into challenges presented as early as the 1950's. One of these challenges was the changing growth pattern of the United Church. As expected, the United Church grew in its early years but it simply did not grow as fast as it needed in order to achieve its desired national church status. Not only did it not grow according to plan it can also be argued that it didn't really mature the way it should have either. A lot of compromise went into the founding theology and structure of the United Church. Even though there's been some pecking around the edges of the overall structure of the denomination it remains the same as when it was created. Another challenge was the apparent failure to sell the uniting vision with ecumenical partners such as the Anglican Church and Disciples of Christ. Without these partners the United Church couldn't achieve the breadth of theology and practice necessary to achieve the dream of being a national or state church. The failed effort to join with the Anglicans is especially troubling because of the lost opportunity to create bishops who would provide the regional leadership necessary to grow the denomination and help it mature. If readers want to identify still more seeds of the United Church's decline and pending death they need to look no farther than p. 85 and the numerical decline of the number of young people in the denomination and the shortage of candidates for the clergy. What surprises me here is that this decline began in the 1950's. Of all the decades in the 20th century the 1950's would be that time when one could expect the church to be strong and thriving. It turns out that it wasn't and this should be food for thought. Even with this decline, however, there are some areas in which the United Church continues to be strong. One area of strength is our work with Aboriginal people and communities. While there have been serious bumps in the road we seem to have developed a rough partnership where we can address and resolve justice issues and concerns in some realistic way. While it may border on obsession the United Church has also been effective ministering to the gay and lesbian and transgendered communities. Anyone who experienced the debates about the ordination of practicing homosexuals know the extent of how much these decisions and commitments cost the denomination. The problem with these two strengths, however, is that the issues are not unique to the United Church. Both aboriginal and gay people can access resources and help beyond the church. And effectiveness in these areas is simply not enough to change the denomination's future. In the not too distant future the United Church will die and the seeds for this death can be found throughout its history. A History of the United Church of Canada is a concise, thorough and critical resource that offers us a great deal of insight into this history and an even deeper appreciation of the challenges we face in the present. I commend it to each and every one. I find myself investing an increasing amount of time and energy on my writing work. As I've passed the 50 year old mark I've gained a more clear idea of what I want to do with the rest of my working life and the projects I want to take on and complete. It turns out that I want to accomplish a lot and that includes the publishing of a number of books representing a variety of subjects. To do this work properly I find myself tearing a page out of the contractor's handbook (If such a thing exists) and filling toolboxes so that I have the necessary resources with which to work. Two of these new tools are books by Heather Robertson and Harry Bruce. Robertson's book is entitled Writing From Life and is a handbook on how to research, write and market nonfiction work. Robertson is an experienced journalism who has published a lot of work throughout her extensive career. The first chapter, alone will improve our game. I didn't agree with everything she wrote but that's the point of reading and thinking about the content of any book. There's simply no way we can agree with everything someone writes and learning where these points are is an important way of developing our critical faculties. Bruce's book is Page Fright and is a collection of miscellanea about writers throughout the ages and how they approached their task. He examines how writers have lived and worked and told stories about their quirks and "foibles". He tells us about the drunks who can only write while inebriated and others who have to stand at a desk naked in order to get their thoughts moving. He discusses the value of using pens and pencils, the evolution of technology such as computers, and even the value of routine and discipline when working on an idea or project. Both books make some shared points. They both tell us, for example, that we need to find our own voices. This is easier said than done. For many writers it takes a lot of time and experimentation before we can express ourselves in a way that is unique and effective. Process is also an important part of our writing. How we write is as important as what we have to say. Some writers find it best to write in the morning and some at night. Other writers prefer a quiet office while many want to be out in more social and public spaces like coffee shops and libraries. I'm learning first hand that when it comes to a writer's work there are no right or wrong approaches, styles, or answers as long as we do good work. That is one goal we can all share, however. Doing good work and enriching our readers' world is hopefully something we can all agree on. Mike Jones, author of Vogelstein's Dead Reckoning: The Six Phases of a Funeral. Is the Nation of Georgia a European State? Why Write "My Apprenticeship: An Intellectual Journey"
© Vogelstein Press 2015. Simple theme. Theme images by digi_guru. Powered by Blogger.